Davidson Center, the Jerusalem Archaeological Park, is located nearby the Western Wall in the Old City. Davidson Center is one of the Jerusalem’s top tourist attractions due to its historical and archeological significance and, of course, its beauty. You will find archaeological finds and displays from the First& Second Temple periods: the ancient city wall, the Temple’s staircase, a preserved ancient street, ritual immersion baths, and stores. Enjoy coffee& pastry at the site’s entrance before/after your visit! If you’re planning on hosting an event and looking for a unique location with a professional and knowledgeable staff, the Davidson Center is the right choice for you. From private events, such as weddings and Bar/Bat Mitzvahs to conferences, product launches and ceremonies -this place hosts all kinds of events. As an extra value, you can also include in the program of your event educational activities and tours around the Old City and the Jerusalem Archaeological Park. Davidson Center can accommodate events of up to 1000 guests. Davidson Center is home to some of the most intriguing and important archaeological finds from the Second Temple period. Researchers have discovered a wide and impressive street nearby the Western Wall. Apparently, this street used to be the area’s main street and was visited frequently by pilgrims, tourists, and sages such as Rabbi Yohanan ben Zakkai and Rabbi Akiva. Walk the street’s paving stones and immerse yourself in the story of ancient Jerusalem where thousands of Jews walked 2000 years ago, making their way to Temple Mount. Walking the street, you will also notice huge stones. These stones were knocked from the walls of Temple Mount and have been lying there ever since. Another impressive discovery is a drainage channel which was found under the street, containing rare finds from the days of the destruction of Jerusalem. This channel used to be the place where ancient warriors escaped to, hoping to find shelter from the Romans. While you’re there, explore the Southern Wall where you’ll find an ancient staircase leading to Temple Mount. This is how the pilgrim entered the Temple. In addition, the Davidson Center houses a museum with all of the site’s most significant finds that were discovered during excavation work in the area. 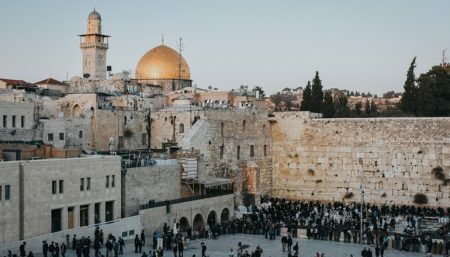 Some of these exciting discoveries include remains from the Byzantine period, proving the existence of Jews in Jerusalem during a period of time when they were not allowed to live inside the city. Another interesting attraction you will find inside the museum is a 3D model of Jerusalem where you can walk around, visualizing the pilgrims’ experience. Add extra 16 ILS for a guided tour around the site and museum, a virtual reality display, and the Archaeological Park. A great archaeological site that is so very important to the old city. Best with a guide to fill in the stories that make you feel what it may have been like at that time. Must also be very careful walking around here because lots of unevenness and rocky. You can get some really nice pictures of that really old feel that takes you back to old times. If you’re around the Kotel with time to kill, this will do the trick for about 45 minutes, tops. There isn’t much to the actual museum: a few coins and a fragment of clay tablet. The movie recreation of a pilgrim’s journey to sacrifice at the temple was interesting, although dated. The grounds are pretty (we were there in spring, when poppies and wisteria were in bloom) and the cafe (really more of a food kiosk) sells a decent cappuccino. The Jerusalem Archaeological Park takes you back in time to the momentous 1st Century. It is an area that surrounds the Temple Mount and allows you to see the huge blocks used to construct the base of the Second Temple. There is an underground museum with an informative video showing what the Temple area used to look like. Once outside, you can see the ritual baths, the stalls where the money changers Jesus drove out of the Temple area were located, the remains of an arch that was collapsed by the Jewish rebels, and remains of the Second Temple that were thrown off Temple Mount by the Romans, among other highlights. There are also remains of a palace from the Muslim Era and many other ruins in the park, which is just steps from the Western Wall.